As promised, I will show you today the source code of a small game that I programmed. But it is not an original creation, but the reprogramming of a game that has been around a very long time - since 1984. Even today there are many new versions of it and it's still a popular pastime in many ages. Most probably know it from Nintendo consoles, others play it mid way on their smartphones. This game is liked to be cloned and imitated, and not least because it is so "simple". The programming, however, is perhaps not as trivial as one might think ... depending on how you implement it. I'd like to share my version, I made with GameMaker: Studio (version 1.4.1657) and explain a little bit to it. In this archive you will find the entire project, including all images and code. Overall the game is not necessarily written beginner friendly - we want see how it's done "correctly" for learning, and let's see how it looks like. That is, the code is partly highly optimized and no unnecessary Drag'n'Drop was used. Nevertheless, I have the scripts clearly structured and extensively commented (in English). Below are listed some individual parts of the game I want to show and explain shortly. Relevant is only room_game, the others are only prepared for bringing you directly through to the next room, for now. obj_all Persistent (ubiquitous object), which is to take care of everything that can happen always and in every room. obj_intro An object that is to take care of an intro at the very beginning of the game. obj_title This object is to look at the title screen. From there different game modes should be available to be started. obj_tetris_controller The controller is to look after the in-game happenings. It is the centerpiece of the game. obj_tetris_stone This embodies a tetris block of any form. obj_tetris_back Helper object for drawing a background. These are just five of ten scripts, which are used in the game. For the rest you can see in the attached archive. When a new tetris stone is created a random form is passed to it. This script sets a 2D array (matrix) for any of the possible forms that determines which parts of the maximum of 4x4 large stone are set and which are not. The following two scripts are called for the currently falling stone when you press the button for a right or left turn. It assigns the set of tetris parts of the above matrix, so that the entire stone is rotated by 90°. If a falling stone finally hit the ground or other stones (collide after moving), it can be tested with this script if lines are completed and can be cleared. The object obj_tetris_controller is assigned to the room room_game in the room editor. If the game has been started and the room was reached, the controller will take care of everything. 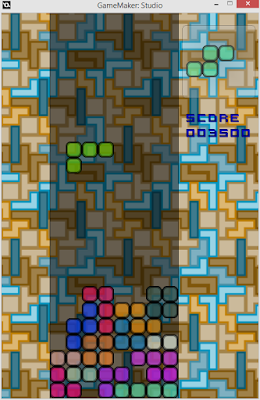 For example it also creates an instance of the obj_tetris_back object which is for handling the background. 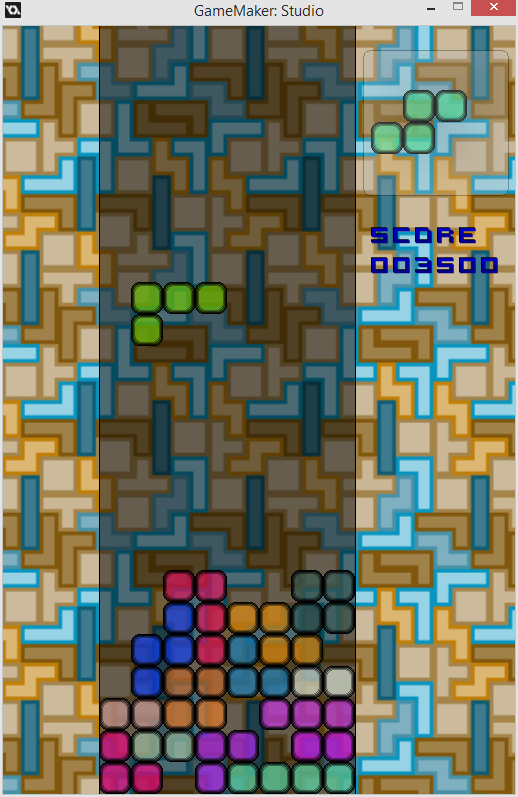 The controller will now create an obj_tetris_stone instance at the top of the screen. Always after a certain time, which is set to a half of a second, or 500,000 microseconds (fall_time = 500000) in the create event of the controller, the current stone is moved one square down. This movement takes place in the step event of the controller. What also happens in this event, is cecking various keystrokes, such as the arrow keys or WASD, to control the stone falling. Depending on what is pressed, the stone is moved to the left, right or down or is rotated by the scripts mentioned above. After each such action it is checked for collision again and if necessary the movement or turning will be reversed, because we do not want overlapping stones. When a stone strikes down, that means reaching a specific height in the game area, or collides with a stone under it, then its movement is stopped. After this stop it's checked via tetris_check_for_clearing for completely filled rows and then a new stone will be generated at the top of the screen. When a new stone was "thrown" in, it is to be checked if there's enough space for it. If there already a collision takes place, the playing field is full and the game therefore is over. © BadToxic. Design "Awesome AG". Powered by Blogger.